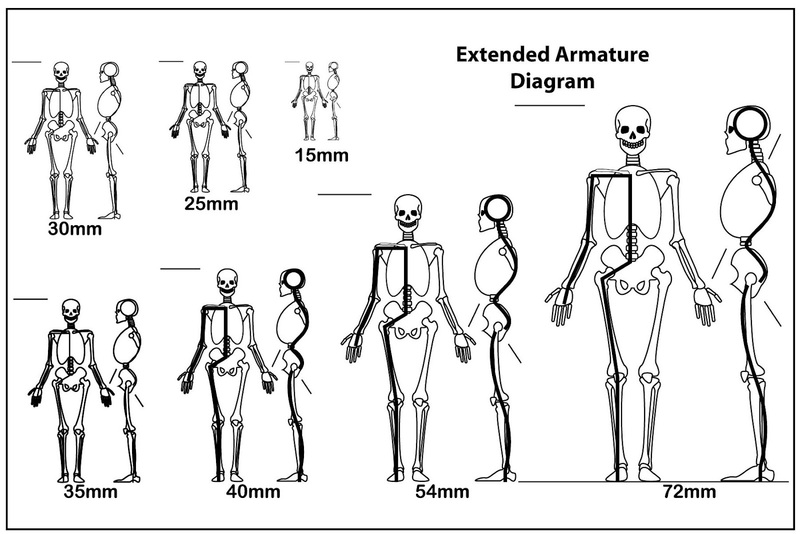 An armature is the skeleton that all sculptures are built on and provides a foundation for the pose to act as a guide for proportions. I've seen quite a few elaborate armature constructs and sculpting rigs that took more time and effort away from the actual sculpting than what I wanted to spend. There are even a few expensive setups you can purchase ready-made but are more pricey than I what wanted to spend. 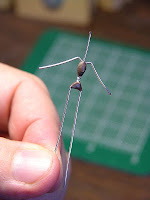 What it has really come down to is the fastest, cheapest, easiest and most accurate way to make an armature and get to the sculpting part as soon as possible. I initially started off using the Reaper Advanced Level Sculpting Armatures - #75002 which was a great time saver and gave a good approximation of the size most figures are being sculpted around. These are great time-savers and are particularly useful for male figures or heavily armored characters. 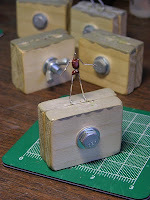 When I need something more slender, I will go with a wire armature. Most all of the sculpts I do now are made over wire. 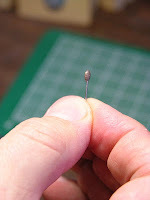 I use a silver-plated copper beading wire in two main sizes. The most commonly used is 26 gauge and is flexable enough to pose easily, yet strong. The 22 gauge is used for bulkier figures or for larger scales like 54mm. Also, this particular wire is easy to cut through. If I need to take an arm off for modification or for molding, it is easy to cut through the putty and break the wire free without causing unnecessary damage to the sculpture. 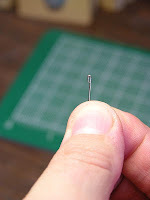 For normal 28mm or 30mm human-sized figures, I generally cut two 3" lengths of wire and twist them together. Start about 1/3rd of the way in and twist until you have about a quarter of an inch to the twist. This will give you a general torso length to the armature. You will have one pair of wires that are longer than the other. The longer ones will be the legs. 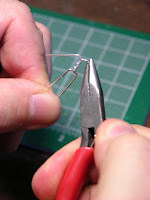 I then bend the wire at the shoulders and hips. 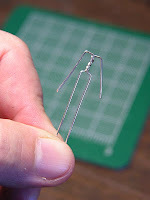 You can use one of the Reaper armatures as guide for size. Generally a 1/8" bend will give a good width for the shoulders and hips. I cover this with a bit of putty, typically straight ProCreate to secure the pelvis area and the ribcage so I can pose it easier. At this point I also like to add a little neck wire. 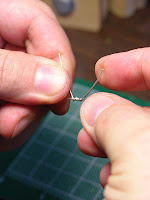 I fold over one end of the wire with pliers and add a small blob of putty. This is then attached to one side of the ribcage and then smoothed into the rest of the putty. This all goes under the 60W lamp for 30 minutes or more to make sure the putty has fully cured. 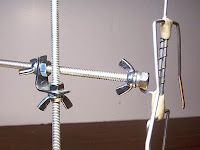 The armature can now be attached to a cork or gripped in a clamp and posed appropriately. Here I have printed out several poses of a model to check the size and proportions of the armature. The neck wire is left longer than the top of the head. This extra length is trimmed and then folded down to attach the head at the appropriate height. You can sculpt the head directly on the armature at this point. I sculpt the heads separately whenever possible and then attach them to the neck. This allows the greatest flexibility to adjust the pose and position of the head. I leave a bit of extra wire at the feet and bend it to where the wire forms a foot. This allows the figure to be mounted at the toe, which is very important for a lot of action poses. The wire is trimmed with a pair of wire cutters at a steep angle making a sharp point on the end. This allows the wire to be inserted into a cork base much easier. Watch your delicate fingers, though! Most of the time I use corks to hold my sculpts as I work on them. After drilling a couple of small holes in the surface putty of the cork I insert the wire and then secure it a bit at the feet with more putty. I used to just lock the armature in one of my custom-made wooden clamps but found this to be cumbersome and difficult to grip while working. 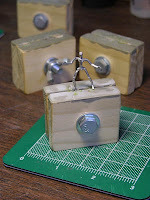 I try to make up lots of armatures and then keep them on hand ready to sculpt. 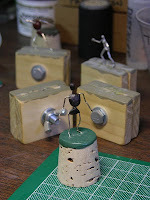 After they are posed I stick them to regular ole' cork stoppers for finalizing the pose and sculpting. The most common sizes are the ones with 1", 1 1/2" and 2" bases (or tops), the largest part. 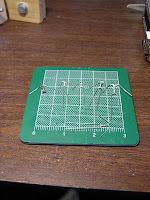 This gives a good foot spread for common slotted base sizes. Some of the corks I mounted on 2" lengths of plastic PVC plumber's pipe. This gives a more comfortable grip especially for smaller figures or for sculpting faces. I basically jammed the small end of the cork into one end of the tubing section and then hot-glued it into place. Of course, your best bet is just to use what's comfortable for you. I can't take any credit for this approach or design, that goes to Chuck Needham, a fantastic historical and garage kit figure sculptor you can visit over at 2Bit Studio. What makes this design so cool is its' modular layout. The diagram is one I downloaded from Chuck's site and adapted to different scales. 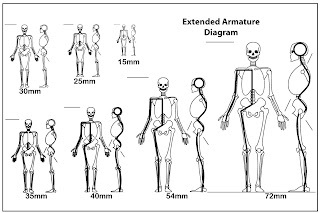 The proportions are all correct regardless of what size you scale the diagram since they are all based on an average human skeleton. Creatures can even be based on this with a few modifications to the lengths of the limbs. 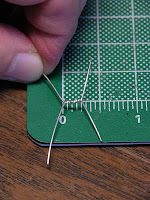 Once the correct size is selected, I bend two lengths of the wire in the shape following the limbs with a pair of needle-nosed pliers, one for the left limbs and one for the right. Another length is cut and curled around the skull diagram to provide a solid base for the armature's head. Chuck made a fancy bending jig to wrap his wire around but I work in so many different sizes I normally just trace the shapes with the wire directly from the print-out. 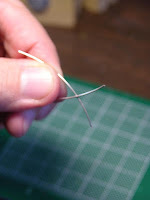 For larger scale figures I use a basic aluminum wire. 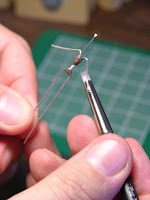 The parts of the armature are wrapped with a thinner "floral" wire and then secured with either a blob of Aves Apoxie (shown here) or sometimes with JB Kwik epoxy. 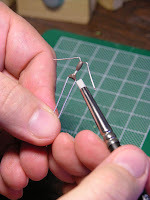 The extra length of wire coming from the head section strengthens the "spine" and is bent at the hips to create a mounting point for the stand. Alternately, you can leave additional lengths on the bottom of each foot to attach to a base for sculpting. Sometimes a brace of some sort is in order to support the sculpture as you work on it. The rig shown here is made from inexpensive parts found at the local hardware or DIY. The threaded rod is 1/4" coarse and fitted with corresponding wingnuts and lock-washers to make repositioning a snap. The small L-shaped shelf brackets are used to hold the support rod to the base rod. It's very important to note that to get this to work correctly the bracket must be bent off center a bit to allow the second rod to pass through at the side. This is shown more clearly in the closer photo. All of this is mounted to a simple wooden stand. The whole setup cost about $20USD and supplied enough materials for four sculpting stands. That comes in really handy if you work on several figures at a time. 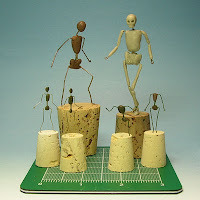 I tend to make up a few armatures of different sizes and keep them on hand. That makes it especially useful when mixing up a batch of epoxy putty that none of it goes to waste. There's always an armature handy to stick it onto.